His palms are sweaty, knees weak arms are heavy. The opponent next to him is ready with a win streak that’s steady. He’s nervous but on the surface, he looks calm and ready to drop bombs, but he keeps on forgettin’, combos to lay down, the announcer’s voice goes so loud, screaming out “Final Round!” but the moves won’t come out. He’s chokin’ now, everybody’s jokin’ now, the reversal comes out, it hits, it’s all over. Blaow! Now, let’s snap back to reality. As much as I would love to indulge in the idea, I will never be a high-level fighting game competitor. I just don’t have the time, patience nor the cognitive skill to hit such a high level. However, the genre as a whole still stands as one of my favourite in gaming to where I have sunk hundreds of hours into various competitive fighters. Yet despite the genre’s rather intimidating reputation, it’s always great to see a title that is more than willing to provide the necessities to teach you how to get on top of your game. While I will dig a bit deeper into the gameplay mechanics soon, understand this: BlazBlue Cross Tag Battle does a great job at providing the tools to help a newcomer grow, given that you are willing to put the work in to improve. It also provides enough depth to keep the seasoned competitor happy with a simple yet deep structure. It is, after all, one of the main entries in attendance at Evo 2018 – the most popular fighting game tournament of the year. 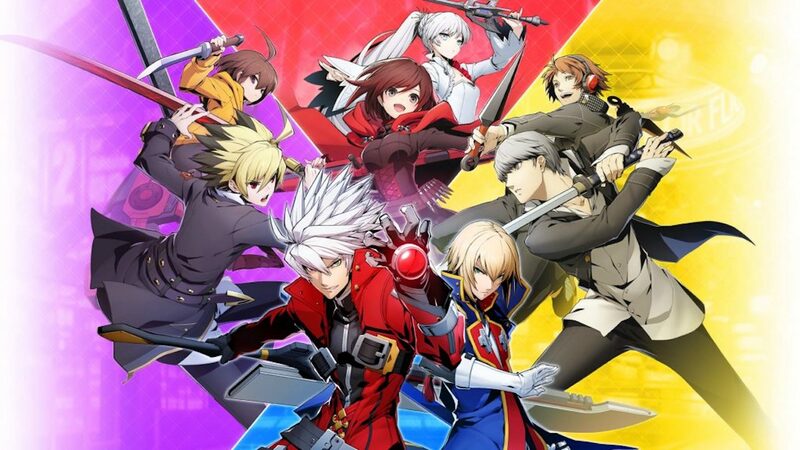 BlazBlue Cross Tag Battle is the first fighting game from Arc System Works to drop on the Nintendo Switch. Initially teased on the launch splash screen of upcoming game releases, this little anime fighter has you brawling in teams of two from a roster handpicked from some of the developer’s back catalogue of fighting games. While characters from BlazBlue, Under Night In Birth and Persona 4 Arena are here to join the fray, Rooster Teeth’s popular anime RWBY also gets in on the action for the first time. Each combatant that’s been plucked from their own world has a distinctive trait to throw down with, yet all have a common underpinning set of mechanics that BlazBlue Cross Tag Battle abides by. As a rule of thumb, your five action buttons consist of A, B, C, D and SP. The A and B buttons are set out as your primary attacks that can be used to string auto-combos, known here as smart combos. Combining the two simultaneously can generally give you an anti-air Dragon Punch-style advantage while pressing the same two buttons in a guard state will force the opponent to be pushed back for some well-needed space – providing, of course, you have meter at your disposal. The C button is used as a universal overhead to open up crouching opponents and sets off a stylish team combo attack when landed successfully. The C button also has other various properties depending on wherever you are in the air or crouching with the latter usually sweeping the legs from underneath your rival. As far as stick command inputs are concerned, you need not worry of anything more than a quarter circle motion and a button press to throw out a special move. Combining two buttons with this stick input will, in turn, give you even more attack possibilities. In combining these actions between smart combos and throws in battle opens up the imagination for some serious combo potential. Where things begin to get even more hectic is in how your selected teammate is eager to throw the dig in. The D button allows you to instantly swap your fighter on the fly while the SP button throws your partner into one of three aggressive states. Tapping back, forward or keeping neutral while slamming on the SP button will catapult your teammate into rushing in at one of three different angles. Again, opening up even more combo possibilities and counterattack strategies. While the game rewards you for aggression, there’s plenty of defensive options to keep you afloat. You can interrupt a receiving combo by breaking it with your partner’s interruption at the cost of some meter, while air blocking, jump dashing and quick recovery options keeps manoeuvrability fast and flexible. When explained in words it can all sound quite overwhelming, especially considering that there’s even more depth to the combat than what I have noted here. It’s all easy enough to understand in practice though, thanks to the simple button input structure. Combos can be as basic as spamming your attack buttons, while more advanced, frame-tight juggles can be landed by the more seasoned player. Where the game can get quite intimidating is actually knowing when it’s your turn to attack. There were plenty of times when I would be guarding for my life in the midst of the madness only to get opened up for misjudging my window of opportunity. The three meters at your disposal may scare the more casual gamer into confusion even further, but they do fill up at a fast enough pace where they do become approachable enough to grasp after a couple of matches. Without going into too much detail, you have a meter for more powerful attacks, two bars for various assist possibilities and a tiny square symbol that fills up for making the use out of your team swapping aggression. Under the right conditions, this square will grant you the opportunity to pull off a game-ending cinematic attack called Astral Finish. It’s a rare condition to hit, but satisfying to pull off to end a match in style. As far as the game showing you the ropes are concerned, there is a highly in-depth and easy to follow tutorial set in place. There’s even a dedicated overview for each character running you through various individual advantages and a handful of combo possibilities. The training mode is robust enough to keep the lab rat busy, along with a list of challenges and Survival mode to test your skills. As far as core single player features go, you can dive into the game’s crazy anime Story mode, but, unfortunately, there is no traditional Arcade mode to blaze through. Other than that, there isn’t a great deal here to keep the lone casual gamer going – unless, of course, you’re keen to spend the time to hone in your skills in training to face the sharks online. One thing that I do have to take my hat off to is the net code. It’s probably the best online experience I have had with a fighting game. Minus a stutter intro here and there, I surprisingly ran into very little lag throughout the many matches I played. I found this particularly impressive considering the high margin of gamers playing over a wireless connection. Fighting games usually don’t have the greatest reputation when it comes to online, so it’s great to see BlazBlue Cross Tag Battle heading in the right direction. Visually, the character designs keep inline with BlazBlue tradition using bold 2D sprites that flow well nicely under the pace with smooth animations and good collision detection. The 3D polygons in the backgrounds could be a bit better as they tend to look a little lower in budget to other outings from Arc System Works like Guilty Gear or Dragon Ball FighterZ. However, the arenas themselves are full of personality and look interesting enough with a decent variety on offer. The soundtrack to accompany the action is fantastic with a J-pop twist, making every encounter feel like a final showdown at the end of an action-packed anime. Where things get slightly more controversial is how the downloadable content has been implemented. There are around 20 fighters out of the box with another 20 in total planned for future downloadable content. Many of these characters are already locked in-game in a similar fashion to the negative backlash of Capcom’s Street Fighter X Tekken. Where BlazBlue Cross Tag Battle gets a little more lenient in value is how the core game itself is at a lower price point than a full-price retail title, in that online retailers list it at £25 – £30. The Season Pass for the downloadable content stands at around £15.99, which turns the core budget on par with a full retail release. Early adopters can get the Additional Characters Pack 1 for free, although, for those in Europe, PQube has explained that a temporary blip has meant that this hasn’t been made available but should be up and running soon. All in all, BlazBlue Cross Tag Battle is a great 2D fighter that has plenty of depth with easy to learn mechanics. Believe it or not, the simple five button input system is intuitive enough when using a single Joy-Con for some quick on the go rivalry. The game looks lovely on the portable home console’s small screen too, making those table top matches feel even more like a coin-op experience. Even the net code for online play is outstanding, with a well thought out playground-style lobby system to boot. Just remember that if you are new to fighting games, don’t go in expecting to body the online world. It is just not going to happen. Well, not until you put some work in at least.